Good. No Jacket. Size: 19 to 25 cm tall, Octavo, (8vo); Illustrated in colour. 448 pages. 1st class post to the UK, Airmail worldwide. Robust packaging. Jonathan Lovekin (photographs) Near Fine in Near Fine jacket. 4to-over 9¾-12" tall. 1st Printing. First edition first printing quarto hardback 448 pages illustrated with many colour photographs Near Fine condition in Near Fine unclipped dust jacket. No inscriptions. Lovekin, Jonathan. Fine in As New jacket. 1841152889. Near Fine Condition in Very Good jacket. Signed by Author. SIGNED by Nigel Slater to the title page. Contents are clean and unmarked, slight age toning to edges; creasing to upper edge of jacket and top of spine. 448 pages. Quantity Available: 1. Category: Cooking, Wine & Dining; Signed by Author. ISBN/EAN: 9781841152882. Inventory No: dscf8791. 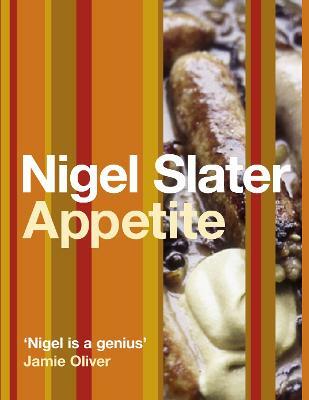 One of the key concepts in Nigel Slater's _Appetite_ is to give you a basic outline of what goes into a certain idea of a dish (say a hearty winter soup or a lighter springtime salad) and then offer up variations on that theme. You can learn how to cook with what you have as well as learn to shop for groceries with the seasons. Amounts and measurements are flexible and approximated, so a knob of butter isn't a strict order. Note that this book isn't strongly oriented towards lite or vegetarian dishes, there is a lot of butter, cream and deliciousness (I know they're not mutually exclusive) involved.